Staring At Trailers: Is The New “Godzilla” Movie Going To Be…Good? The official trailer for the new Godzilla movie just came out and I am really torn on it. The last attempt at a Godzilla movie was an absolute travesty. 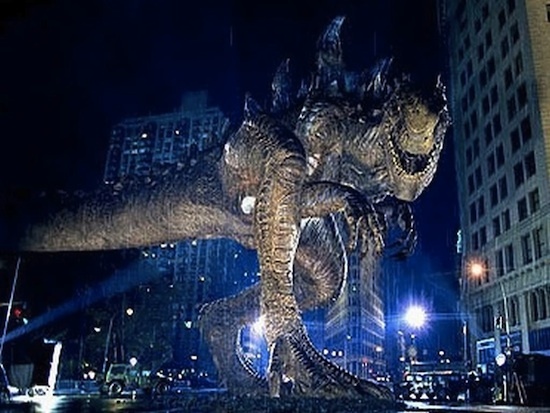 It was a typical over-promoted 90s blockbuster with Matthew Broderick bopping around NYC and some lame attempt at a CGI Godzilla f’ing things up. Godzilla was the only creature that laid more eggs in Madison Square Garden than James Dolan. However, there are a few things that give me some hope for this iteration of that big freaking lizard. Bryan Cranston is in this movie. This is his first big role since being the one who knocks. It took years for him to get a role like Walter White, but he has always been a great actor. So at least you know that the lead acting role is in good hands. Cloverfield was a pretty fun movie to watch despite the constant shaky camera. So a giant lizard monster attacking New York City can clearly work. There are a few moments in the trailer that are terrifying. The giant waves, the loud screech, the planes crashing, and the first time seeing Godzilla all are pretty intense. It doesn’t seem like this is one of those “Hey, we acquired rights to make a Godzilla movie. Now here is everything except for Godzilla” type of films. Based on the few glances we get of the monster, Godzilla actually looks like Godzilla. It’s crazy to think that people could mess up the most important part of a Godzilla movie, but they did exactly that back in 1998. Based on the breakdown of the trailer, we will get a little backstory to it all. Hopefully not too much, but enough to give everyone an idea why this gigantic SOB is crushing NYC like Daz and Kurupt. So all things considered, I am going to take a wait and see approach with this movie. I will check out the Rotten Tomatoes reviews once they start rolling in around May, but as of now I am leaning towards seeing it in the theater.